Looking for professional string players? Here we are! Classically trained musicians performing together in a string quartet, playing anywhere in DFW from Dallas to Denton. Our violinists, violist, and cellist come together to form a string quartet great for weddings, receptions, dinner parties, Christmas parties, anniversaries, or restaurants in need of romantic, lively, or elegant music from Stringbirds™ various ensembles. 1. 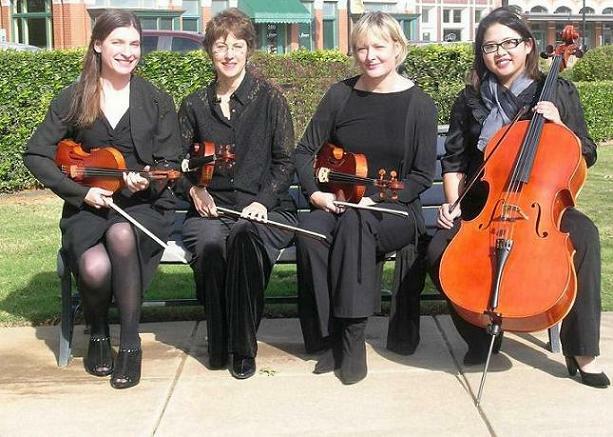 Listen to the string quartet Music Clips performed by the musicians for hire in Stringbirds™. The posted selections demonstrate several ambiance possibilities to occur before or after a wedding ceremony, or other special occasion. 2. Select music for your wedding ceremony. Let this site help you save time and offer you security during your music selection process. The Wedding Music Samples performed by violin solo or duet will help brides recognize the melodies from traditional processional and recessional music. 3. And, visit our Play List to view a partial list of our literature. It is highly versatile in its ability to suit the needs of varied settings - religious to romantic, regal to folksy. This is largely due to the fact that our collected literature spans 500 years of classical time periods and includes more recent styles such as folk, fiddle, ragtime, and Broadway. 4. Learn more about how our violin family can be assembled into different Ensembles ranging from two to four performers. Choose a group that fits the space available at your event, and your allotted music budget. May you love what you see and hear, and be ready to Contact This Violinist !